Clever! 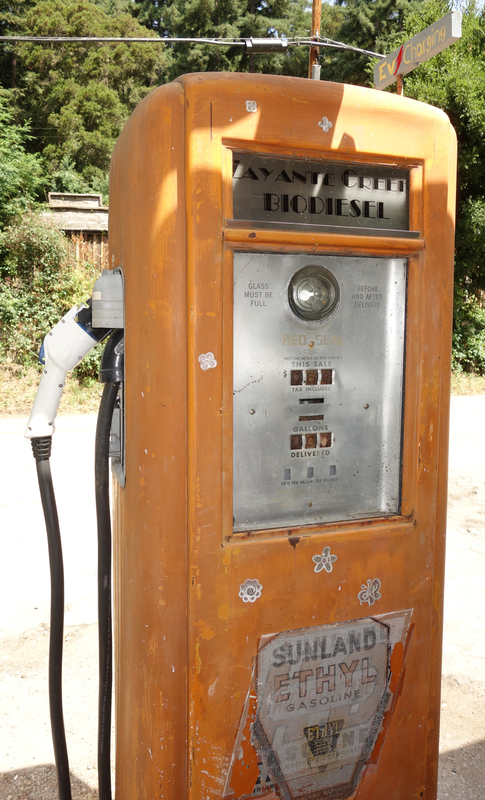 Zayante Store’s biodiesel fuel pump has been put to good use. Guess what? 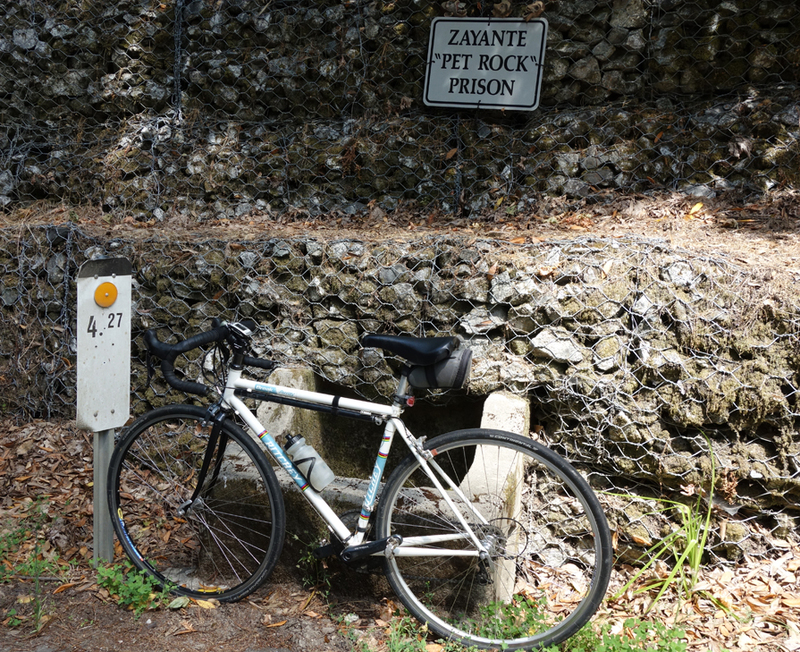 One of the roads hammered in this winter’s rains was Zayante, a secluded route that goes from Felton to Summit Road. I decided to check it out, knowing that the road is open. I came in at Quail Hollow Road, my usual route these days. I saw several locations lower down where the road has been eroded, but it got worse just past the fire station deep in the redwoods that marks the last of the steep climbing. I had already seen numerous places where the road is caving in during my climb from Zayante Market. But just before the hard right turn that climbs steeply, the place where Zayante Creek crosses under the road, the hillside on my left had slid out. Then higher up I saw more evidence of mud on the road. It must have been quite a mess. Residents have maintained their sense of humor despite roads collapsing around them. 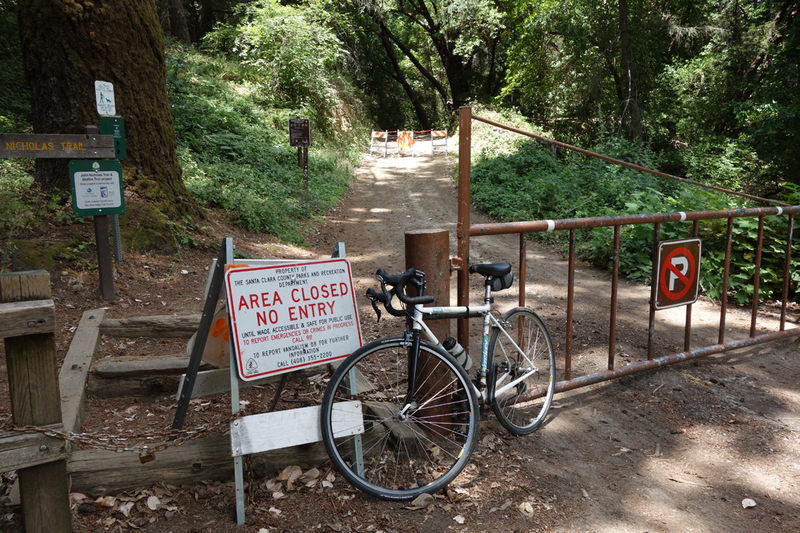 I’ve been riding Zayante Road every year since 1980 and this is the worst I’ve seen it after winter rains. I continued on up Summit Road with the intention of riding down Black Road and home via Lake Ranch Road, which passes by McKenzie Reservoir on its way to Sanborn Park. However, I never would have thought that trail could be closed from the winter rain. I’ve also been riding here since 1980 and never had any problems with the road sliding out. The signs said otherwise. I’m certain I could have gotten through, but decided to continue down Black Road and take Los Gatos Creek Trail. Skyline Boulevard, Hwy 35, is still closed. I wonder when it will be fixed? While it was a bad winter, the winter of 82-83 was equally bad and I don’t recall as many roads being closed. I lay partial blame on the lack of maintenance. If culverts aren’t cleared, bad things happen. Lake Ranch Road closed? That’s what the sign says. This entry was posted on June 24, 2017 at 6:52 pm and is filed under Ride reports. You can follow any responses to this entry through the RSS 2.0 feed. You can leave a response, or trackback from your own site. There were several slides on Lake Ranch Road. Despite being closed it’s easy to just carry your bike over the downed trees and dried mud humps. I rode it through from Black Rd to Hwy 9 on June 25.